We proudly offer Coolsculpting and SculpSure Treatments. The one of very few nationwide and even so in NYC to have Both technologies! ONLY the best FOR the best BY the best! Dr.Avaliani is proud to be a state-of-the-art laser center bringing the latest and newest equipment for her patients and we are happy to be the first practice to receive 2018 Coolsculpting machine!! !Not only does Dr.Avaliani offer the best technology, but we only offer all applicators what come with it to treat ANY area of concern. Dr.Avaliani’s state of the art laser center only believes and offers brand new, latest and best laser treatments and that is why we waited for more research studies, safety reports and more treatment option to provide the best and safest treatment. 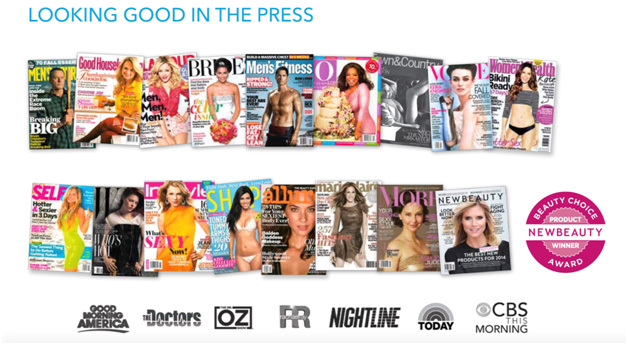 Coolsculpting is a best kept celebrity secret to staying in shape!! See the media features. It is #1 fat reducing treatment worldwide and has been around for 7 years and going strong! Dr.Avaliani’s office has ALL 5 different types of applicators to contour your body. It is important to find a provider with the right tools and expertise to help you achieve the best results. The machine is only a tool and how the tool is used will determine the results you get. What is the advantage of the new Coolsculpting applicators compared to the older generation ones? 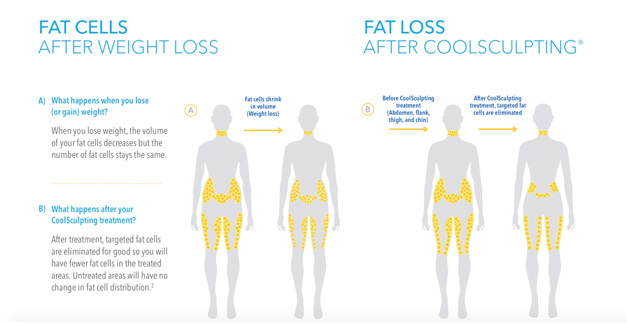 Coolsculping is an FDA approved treatment for non invasive reduction of fat cells using cold cryo air. This process is called cryolipolysis. The cells get frozen and turn into ice during the treatment. Post procedure massage therapy actually breaks the icy cells and destroys them, resulting in less fat cells in that area and that is what gives results. It freezes fat cells during a treatment. Once the treatment is over, frozen cells turn into iceballs which are very fragile. Post procedure massage will break the cells resulting in their destruction. Once the cell is gone, it is gone producing a visible reduction of fat cells in 6-12 weeks. Who is an ideal candidate for Coolsculpting treatment? 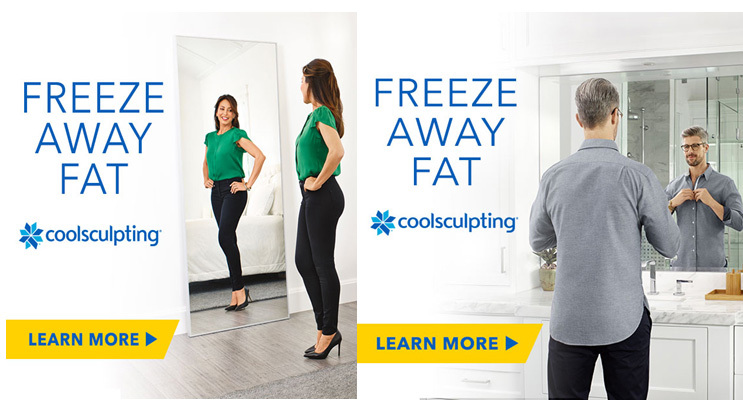 Coolsculpting is not a weight loss treatment but rather a body contouring treatment. It is ideal for people who maintain a constant weight, diet and exercise schedule but struggle to reduce bulges of fat in certain areas. Some people use this treatment as a motivation booster in different to treat areas such as love handles and lower abdomen and under chin fat area, as those areas are very difficult and almost impossible to exercise. 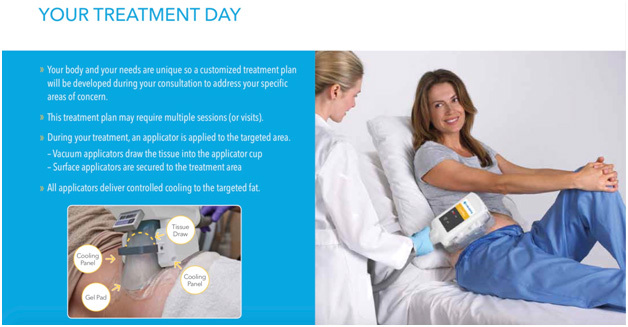 What to expect on your Coolsculpting treatment day? How many treatments does one need with Coolsculpting? Average amount of needed treatments on the SAME area is usually 2-3. Occasionally, one treatment cycle will result in satisfactory result and occasionally it may take 3 treatments to achieve a result. The answer really depends on the amount of fat present in the specific area, the desired result one is willing to achieve in the area being treated, as well as, how well the person is able to adhere to proper diet and exercise. Which areas can Coolsculpting treat on the body? Dr.Avaliani has all 5 different applicators designed to fit and contour any body shape or area. 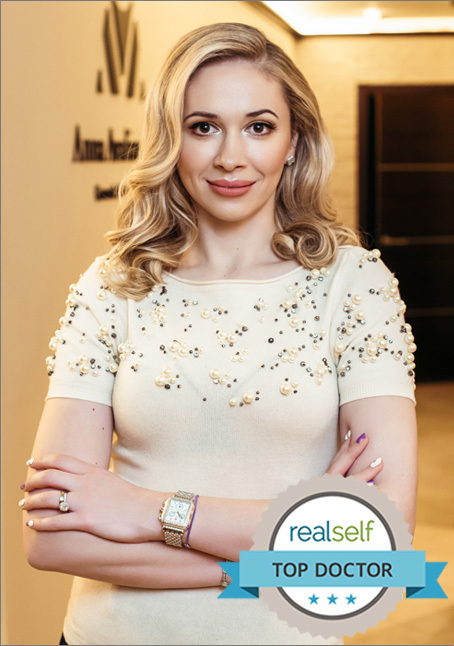 During your consultation, Dr.Avaliani will design a custom tailored treatment to help you achieve desired result. How many applicator cycles does one person need with Coolsculpting? Consultation is required to evaluate and measure the treatment area as well as to design the treatment. It may be one cycle only for lower abdomen or it may take 3 treatment cycles as it depends on the surface area the applicators need to cover. On average, each area of treatment will take only 35 minutes. The CoolSmooth Pro applicator for outer thigh areas takes 75 minutes per area. How does Coolsculpting treatment feel? The sensations differ from area to area being treated and also depend on individual sensitivity to cold.The most common sensations reported are short interval of intense cold, tingling, stinging, pulling, aching, and cramping for the first few minutes of the treatment followed by complete comfort and or numbness. Once can easily be on their smart phone device or enjoy Netflix TV in the room. What are the most common side effects from CoolSculpting treatment? Redness, irritation, tingling, bruising, numbness are the most common sensations reported after the treatment. These are very short lasting and will go away in a few hours to a few days as the area is healing from the treatment. Call 212-673-8888 to schedule your expert consultation with Dr. Avaliani and find out if it’s the right treatment for you! We are body contouring experts.